My wife and I invited some family over for wine and cheese on Sunday evening. She wanted to stay home and get ready so I told her that I would go to the grocery store and pick up some of the things we needed before everyone came over. I told her that I would call her when I got to the store and we could decide exactly what to get. When I arrived at the store, instead of “calling” I opened up Tango, a cross platform video calling app, and had my first real useful mobile video call. Once I connected with her I switched to the back camera on my phone and she was able to easily guide me around the grocery store and help me select items for our guests. I was able to hold up items for her to see and not get into trouble by buying things that she wouldn’t have agreed on had she been there. It was really a neat experience! I think that Apple did a great job marketing their “Facetime” video chat ability…allowing grandparents to see their grandchildren, even allowing deaf persons to sign over video. By finding more practical uses for these applications this is a great way to see how technology is making our lives easier. It’s like we’re actually living in the future! There is still quite a bit of work to be done in making apps work across iOS, Android, and even Mac/PC. Tango was the first app that I was able to make a decent call from my Android phone to my wife’s iPhone 4. I believe Skype for iPhone will work with the Mac/PC platform but I haven’t found a good app for Android to Mac/PC. Hopefully Skype for Android will incorporate video calling soon. But we are getting closer. 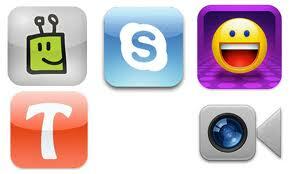 So what are some practical ways that you can think of to make use of mobile video chat? Skype has release a new version just this week that brings video calling to several Android phones. The official version now supports the following handsets: Google Nexus S, HTC Desire S, Sony Ericsson Xperia neo, Sony Ericsson Xperia pro. Droidlife has also released a cracked version of Skype that also brings support to Galaxy S II, Charge, EVO3D, Sensation and Thunderbolt running 2.3. I’ve tested it between my iMac and my Sensation over wifi and it does indeed work. So far it only supports landscape mode and only the front facing camera but I’m just glad to see it finally working. I’ll finally be able to Skype with my parents in another state from my phone now. I’m not sure video chat works with Skype in iOS or not. I think that’s a feature many have been clamoring for. According to Skype’s website it does support video calls on iPhone. Try it out and let us know how it works.